"This is a Lithuanian dish that my family makes mainly during the holiday season. It goes great with ham or turkey. It is also served in many authentic European restaurants. This recipe is time consuming but well worth the work put into it. This is a 'stick to your ribs' dish and is in no way considered lo-cal or healthy. 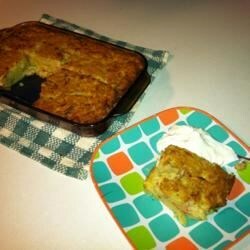 A dollop of sour cream on top of each piece is a great topping." Place bacon in a Dutch oven set over medium heat, cover, and cook until the bacon has softened and begun to release it's grease. Stir in the onion and cook until softened and translucent. Remove the cover, and continue cooking and stirring until the mixture caramelizes and turns a deep, golden brown. Remove from heat and stir in butter to melt. Stir shredded potatoes into the onion mixture, then stir in the evaporated milk and eggs until well combined. Pour into a 9x13-inch glass baking dish. Bake in preheated oven for 1 hour, or until golden on top. Remove and let stand for 10 minutes before slicing into 3x3-inch squares. Serve hot. Tender squash with cheese and crispy crumbs! I made sure to drain-out the water from the shredded potatoes. The kugelis came out delicious -- good enough for my Lithuanian father-in-law to comment how great it is! DELICIOUS!!! Being Lithuanian myself. I really LOVE these Ethnic Reciipes. Excellent for Parties - Makes a Lasting Impression. Time consuming but worth the effort. I liked that you did not have to squeeze the juice out of the potatoes. We made this for an ethnic day at my childs school, every one enjoyed this dish.